A B M P m e m b e r s e a r n F R E E C E a t w w w. a b m p . c o m / c e b y r e a d i n g M a s s a g e & B o d y w o r k m a g a z i n e 15 MIND OF AN MT Have your own insights or inspiration to share for Mind of an MT? Email editor@abmp.com. 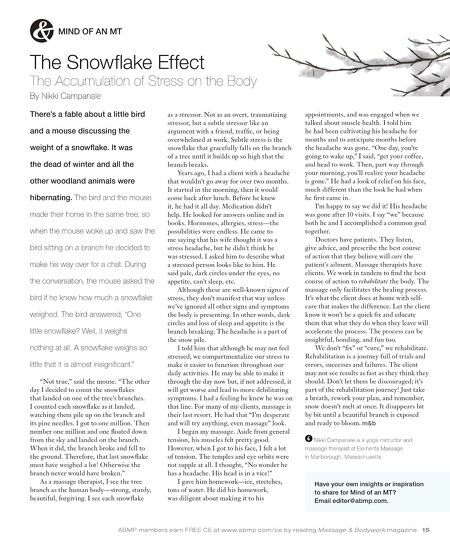 The Snowflake Effect The Accumulation of Stress on the Body By Nikki Campanale There's a fable about a little bird and a mouse discussing the weight of a snowflake. It was the dead of winter and all the other woodland animals were hibernating. The bird and the mouse made their home in the same tree, so when the mouse woke up and saw the bird sitting on a branch he decided to make his way over for a chat. During the conversation, the mouse asked the bird if he knew how much a snowflake weighed. The bird answered, "One little snowflake? Well, it weighs nothing at all. A snowflake weighs so little that it is almost insignificant." "Not true," said the mouse. "The other day I decided to count the snowflakes that landed on one of the tree's branches. I counted each snowflake as it landed, watching them pile up on the branch and its pine needles. I got to one million. Then number one million and one floated down from the sky and landed on the branch. When it did, the branch broke and fell to the ground. Therefore, that last snowflake must have weighed a lot! Otherwise the branch never would have broken." As a massage therapist, I see the tree branch as the human body—strong, sturdy, beautiful, forgiving. I see each snowflake as a stressor. Not as an overt, traumatizing stressor, but a subtle stressor like an argument with a friend, traffic, or being overwhelmed at work. Subtle stress is the snowflake that gracefully falls on the branch of a tree until it builds up so high that the branch breaks. Years ago, I had a client with a headache that wouldn't go away for over two months. It started in the morning, then it would come back after lunch. Before he knew it, he had it all day. Medication didn't help. He looked for answers online and in books. Hormones, allergies, stress—the possibilities were endless. He came to me saying that his wife thought it was a stress headache, but he didn't think he was stressed. I asked him to describe what a stressed person looks like to him. He said pale, dark circles under the eyes, no appetite, can't sleep, etc. Although these are well-known signs of stress, they don't manifest that way unless we've ignored all other signs and symptoms the body is presenting. In other words, dark circles and loss of sleep and appetite is the branch breaking. The headache is a part of the snow pile. I told him that although he may not feel stressed, we compartmentalize our stress to make it easier to function throughout our daily activities. He may be able to make it through the day now but, if not addressed, it will get worse and lead to more debilitating symptoms. I had a feeling he knew he was on that line. For many of my clients, massage is their last resort. He had that "I'm desperate and will try anything, even massage" look. I began my massage. Aside from general tension, his muscles felt pretty good. However, when I got to his face, I felt a lot of tension. The temples and eye orbits were not supple at all. I thought, "No wonder he has a headache. His head is in a vice!" I gave him homework—ice, stretches, tons of water. He did his homework, was diligent about making it to his appointments, and was engaged when we talked about muscle health. I told him he had been cultivating his headache for months and to anticipate months before the headache was gone. "One day, you're going to wake up," I said, "get your coffee, and head to work. Then, part way through your morning, you'll realize your headache is gone." He had a look of relief on his face, much different than the look he had when he first came in. I'm happy to say we did it! His headache was gone after 10 visits. I say "we" because both he and I accomplished a common goal together. Doctors have patients. They listen, give advice, and prescribe the best course of action that they believe will cure the patient's ailment. Massage therapists have clients. We work in tandem to find the best course of action to rehabilitate the body. The massage only facilitates the healing process. It's what the client does at home with self- care that makes the difference. Let the client know it won't be a quick fix and educate them that what they do when they leave will accelerate the process. The process can be insightful, bonding, and fun too. We don't "fix" or "cure," we rehabilitate. Rehabilitation is a journey full of trials and errors, successes and failures. The client may not see results as fast as they think they should. Don't let them be discouraged; it's part of the rehabilitation journey! Just take a breath, rework your plan, and remember, snow doesn't melt at once. It disappears bit by bit until a beautiful branch is exposed and ready to bloom. 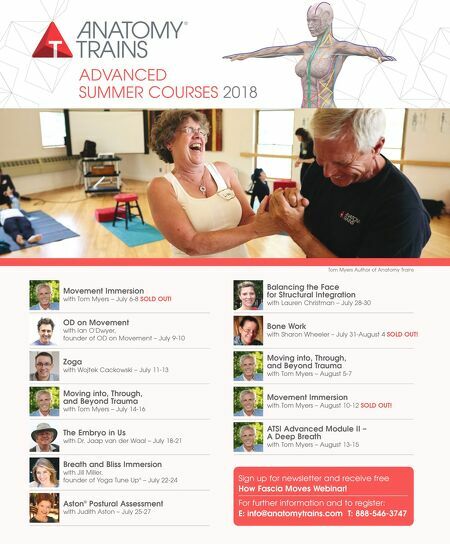 Nikki Campanale is a yoga instructor and massage therapist at Elements Massage in Marlborough, Massachusetts.